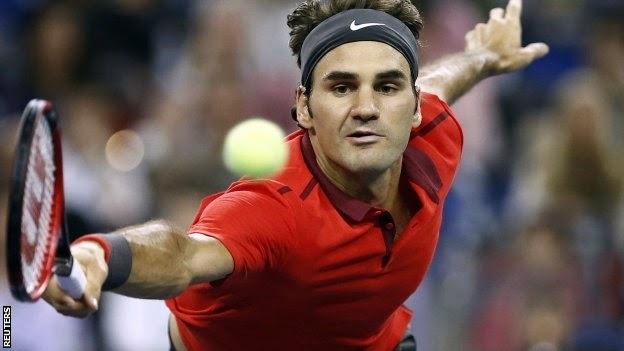 Roger Federer won the Swiss Indoors title in his home city of Basel for a sixth time as he beat Belgium's David Goffin 6-2 6-2 in the final. The world number two broke his opponent twice in each set to win in 52 minutes. Victory increased Federer's chances of overtaking Novak Djokovic to finish 2014 at the top of the world rankings. The 17-time Grand Slam champion has won all of his last 12 matches, and he has moved to within 500 points of Djokovic in the ATP standings. A total of 1,000 points will go to the winner of the Paris Masters, which starts on Monday, and a further 1,500 to the champion at the season-ending ATP World Tour Finals in London, running from 9 to 16 November. Goffin, 23, had lost only two of his previous 45 matches, but his serve was broken in the opening game as he hit a backhand wide. A delightful crosscourt forehand in the seventh game then gave Federer three more break points, the second of which left him serving for the set when Goffin sliced into the net. The Swiss number one secured the set with the third of four successive love service games, ending the set with an ace followed by an unreturnable serve. Goffin saved one break point in the fifth game but hit a backhand into the net after a long rally to hand Federer another advantage. The 33-year-old swiftly secured another double break to leave him serving for the match - and he sealed the win with a delicately-placed shot over the net, which Goffin managed to get to but couldn't return.